Clever utilities are what really get my mouse twitching. In the age of the connected home, more of these devices are disconnected from one another. I have a keyboard and mouse for eight PC’s in my home, 3 of which are HTPCs. The HTCPs in my home all are capable of using a Logitech Harmony Remote control and all are currently using a Rocketfish Bluetooth Keyboard and Mouse Combo, but it still is a bit cumbersome. Instead of having tons of remote controls on my coffee table, I have a Harmony Remote, a laptop, and my Rocketfish Bluetooth Keyboard and Mouse. Well, recently, Microsoft’s Garage Program featured an application created to help alleviate the need for multiple mice and keyboards for multiple computers. The application is called Mouse Without Borders. Mouse Without Borders uses your home network to simulate a type of KVM (keyboard video mouse without the video) between devices. It means that I can use the touchpad and keyboard on my laptop seamlessly on my HTPC. The application even allows you to drag and drop files between two PCs, share screen shots, log off of all your connected machines at once, and log in just the same . All I have to do is move my mouse to the edge of my screen and it shows up on the other PC, much like you would work with one PC that has two monitors. The connection between PC’s is a semi secure connection using a unique token for each machine along with the hostname of the devices. 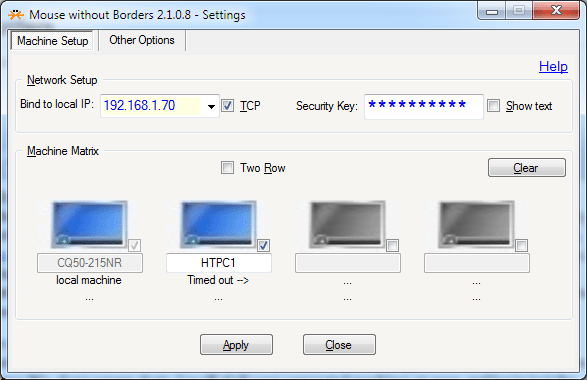 The configuration screen for Mouse without Borders allows you to reorder the priority of devices and make some other simple changes. You have the ability to share or not share the clipboard between connected machines, wrap the mouse, hide the logo on the logon screen, disable easy mouse, disable ctrl+alt+del), and block the screen saver on your other connected machines. 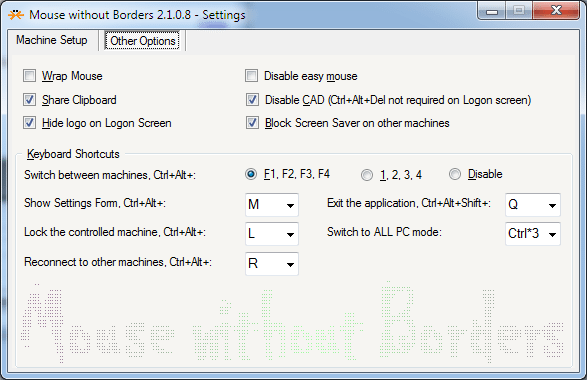 There are also some keyboard shortcut options to let you use Mouse without Borders your way. The ability to disable or choose the way you switch through machines, hot-key the settings menu and exiting the application, lock the controlled machine (the old-fashioned way will lock the machine you are working from), switch to ALL PC mode, and force a reconnection to your other machines should your connection be dropped. Mouse without Borders has proven to be one of those applications that earns the title “Must Have”. The application works flawlessly and makes my PC experience that much easier. Leaving another keyboard and mouse in the drawer instead of on my coffee table is a great benefit. With that, Mouse without Borders will also make life easier for those with more than one PC on their desk. There are times that my laptop, personal machine, and server are going all at once. That means there is a mess of hardware on my desk. Having the ability to run all of these from one keyboard and mouse without having to remote into a machine makes this software invaluable. Bottom line… Would I buy Mouse without Boarders? No, because its FREE!!!! Next C.O.D. NAS Benchmarking Utility – Free!